1873, Jun 9 Enrolled Buffalo, NY; ran Buffalo - Chicago with coal. 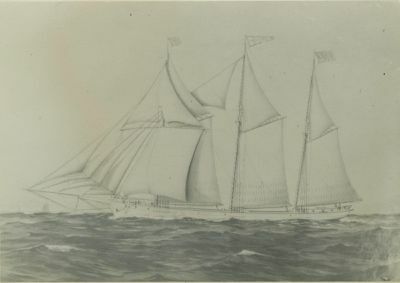 1873, Jun 14 Maiden trip. 1878, Apr 10 Steering apparatus broke in gale off Big Point Sauble, Lake Michigan. 1882, May 3 Aground Colchester Reef with ore.
1882, Nov Lost a seaman overboard, Mackinac Strait. 1883, Oct Collision with steambarge, Chicago, IL. 1885 Towed by CUMBERLAND in Duluth, MN & Buffalo, NY grain trade. 1886, 87, 88, 89, 90 Towed by V. SWAIN many occasions. early 1890s Owned Palmer & Johnson, Cleveland, OH. 1894, 97, 99 Towed by H.J. JOHNSON. 1898 Towed by GEORGE PRESLEY. 1905, Dec 8 Aground Niagara River with lumber. 1909 Owned Hines Lumber Co., Chicago; towed by L.L. BARTH. 1919 Rig changed to barge. 1922 Scuttled at Sheboygan, WI.